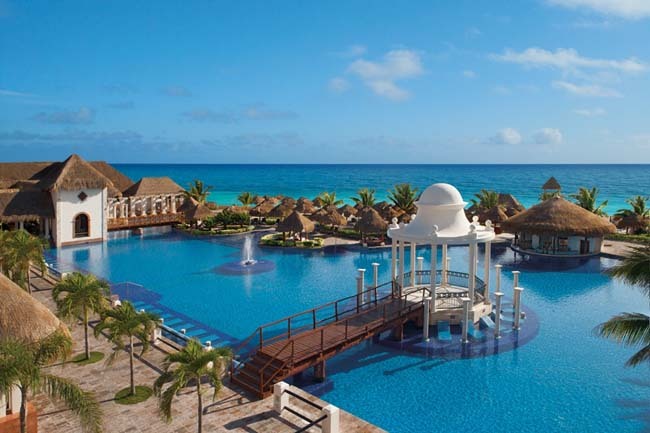 Now Sapphire Riviera Cancun is a sumptuous all inclusive resort of Mayan-inspired architecture with excellent amenities, stylish oversized junior suites, 7 gourmet restaurants and a heavenly spa. 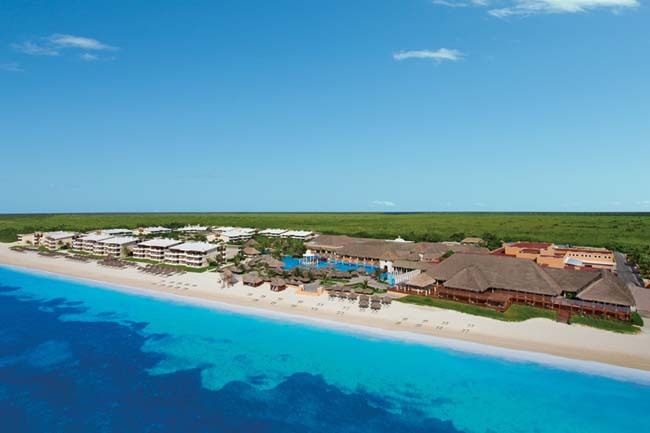 The moment you enter Now Sapphire Riviera Cancun, you will experience Unlimited-Luxury. Carte Blanche to limitless victuals at reservation-free, gourmet restaurants and premium cocktails in some very hip bars and lounges. 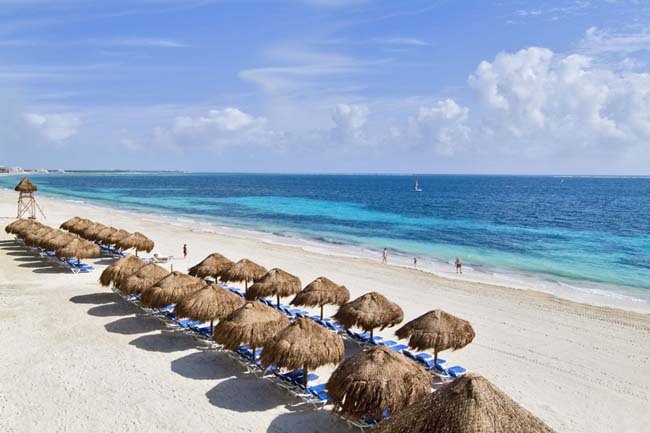 This is one of the best entry level 5-star properties along the top end of the Riviera Maya. It should be near the top of your list around its price range as it’s almost always excellent value for money. 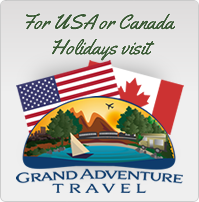 Located near the quaint fishing town of Puerto Morelos, Mexico, just 15 min/12 miles/20 km from the Cancun International Airport. Relax and rest in one of 496 cozy Junior or Preferred Club Suites handsomely appointed with all the niceties, lifestyle touches, and dream views that make your slice of paradise so enchanting. Rooms include air-conditioning, daily refreshed mini bar, tea/coffee facilities, plush robes and slippers, Jacuzzi for two & furnished balcony or terrace. Deluxe Junior Suite Tropical View – features amazing views of the lush tropical gardens that surround the resort from a private balcony or terrace. 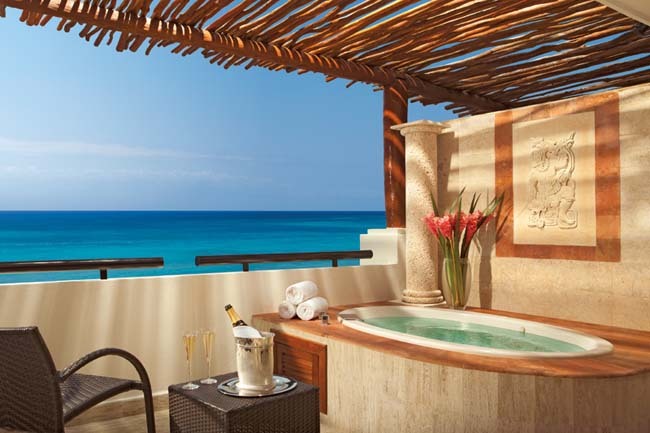 Deluxe Junior Suite Ocean Front – features amazing views of the Caribbean Sea from a private balcony with whirlpool and is elegantly decorated with dark mahogany furniture and marble floors accentuating classic details. 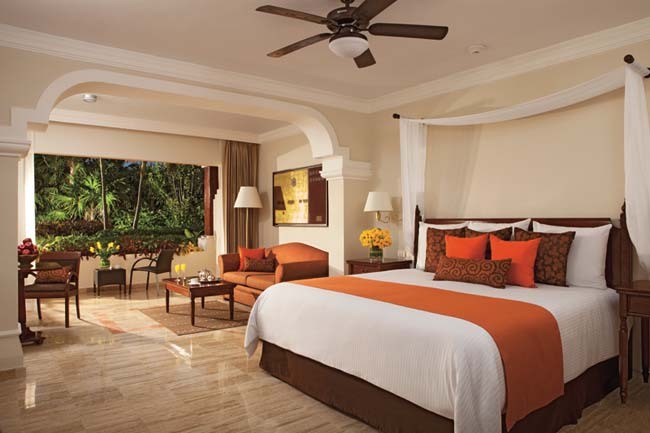 Preferred Club Junior Suite Tropical View overlooks the lush tropical gardens that surround the resort and is elegantly decorated in the tones of the Caribbean with dark mahogany furniture and marble floors accentuating classic details. 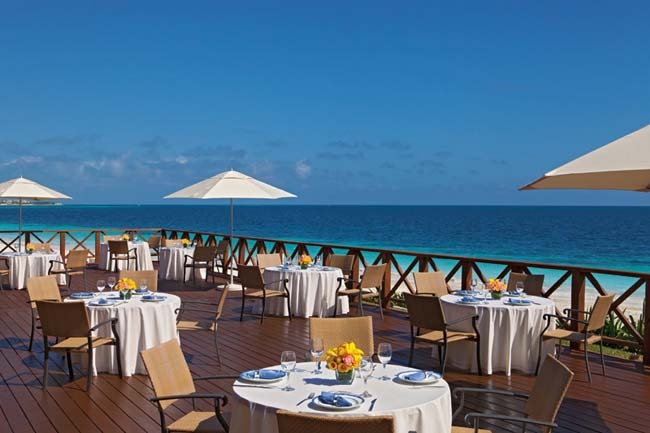 Preferred Club Junior Suite Ocean Front – features spectacular views of the Caribbean Sea from a private balcony with whirlpool and is elegantly decorated with dark mahogany furniture and marble floors accentuating classic details. king bed patio lounge in a double terrace with outdoor Jacuzzi, living room with TV, dining room and VIP front desk. Preferred Club Info – When you desire even more, there is the Preferred Club, which offers personal service and phenomenal amenities such as personalized check-in and checkout with concierge service, preferred status and amenities, upgraded mini bar and room service menu, private pool access for adults-only, featuring Bali beds, a Preferred Club Lounge with a host of additional amenities. 7 restaurants including 5 à la carte, a buffet and a cosy cafe. Paramour – An elegant, romantic atmosphere offering French fare. 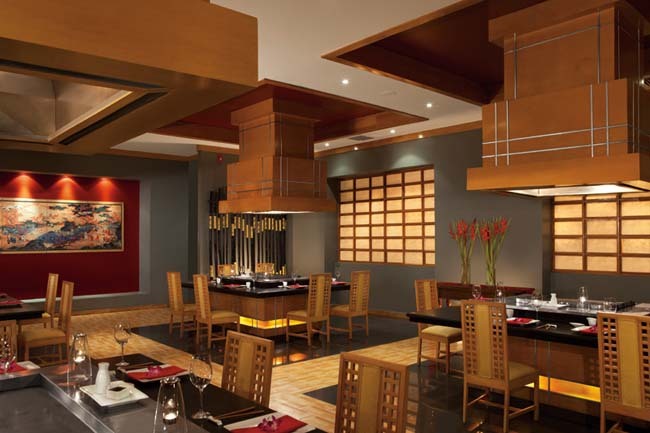 Lemongrass – Taste the best in Asian Cuisine that includes Teppanyaki tables and a Sushi Bar. Bluewater Grill – Offers some of the very best seafood and fish specialities. Cibu – Explore the rich flavors of the Mediterranean. 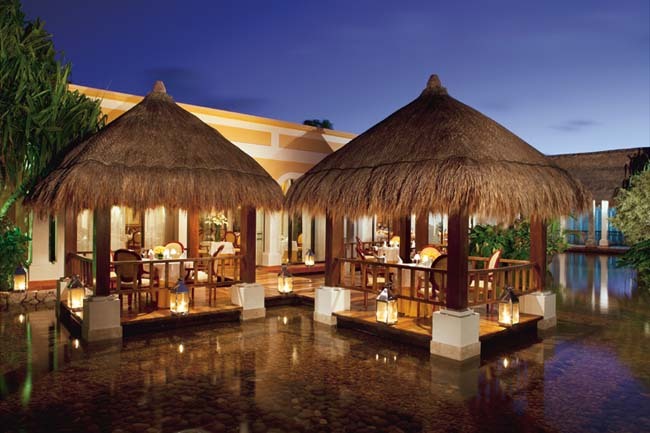 Fresco – Mexican journey to delectable delights. Market Cafe – Specialising in International cuisine, our Buffet restaurant has an exciting decor and offers an international menu in a casual atmosphere. Coco Cafe Sip premium roast coffee and nibble on fresh deli snacks. Moments – Enjoy a refreshing cocktail in this lobby bar. Splash – Swim up and enjoy your favorite cocktail, located in the main pool. Eclipse Night Club – Dance the night away in this lounge offering great music and good times. The Reef – Preferred Club pool bar. The Sandbar – Preferred Club beach bar.